Yamaha’s most powerful street two-stroke, the RD400, is a direct descendant of the machine`s that made the company's name synonymous with motorcycle sport — the famous and incredibly successful twin cylinder road racers. Since Yamaha first appeared with their twin cylinder two-stroke power unit over 15 years ago, it has been continually developed and refined to a pitch where it is perhaps the most efficient and powerful middleweight two-stroke machine in the world today. 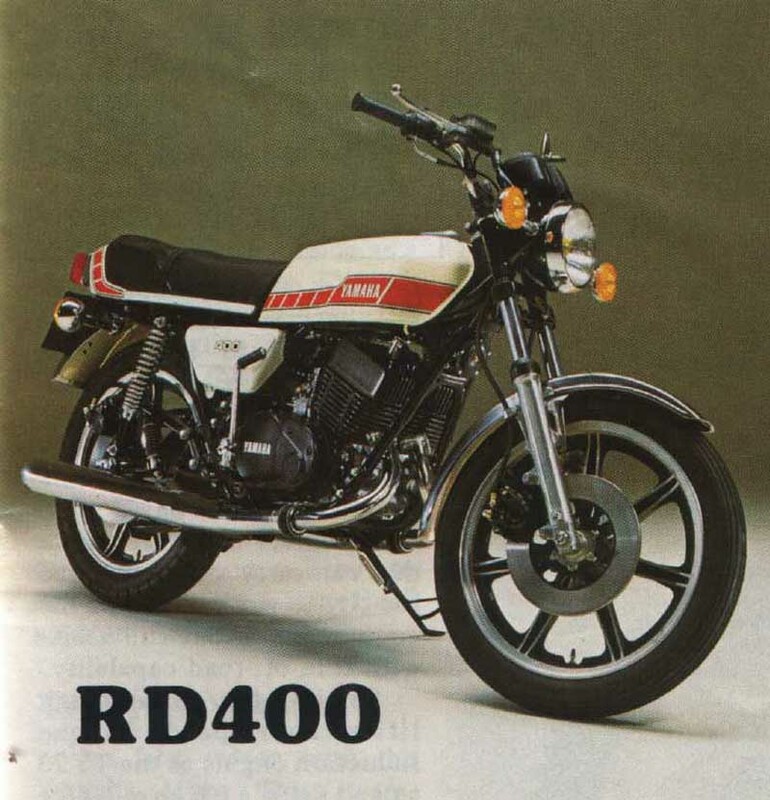 Cast alloy wheels, disc brakes, CDI ignition, reed valve Torque Induction and Autolube oiling are all part of the RD400 specification. The sportiest of Yamaha`s middleweights in terms of both power, styling and handling, the RD400 oozes its racebred heritage from every angle. This is confirmed by a ride on the machine, with acceleration. top speed, braking and handling being almost up to racing standards. 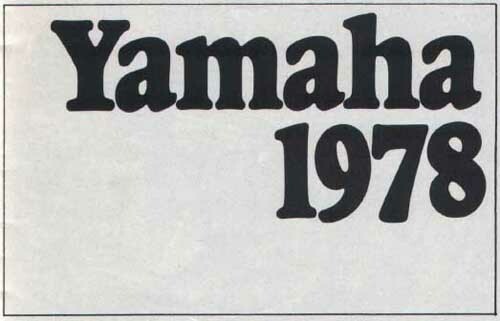 So close to racing standards, in fact, that the Yamaha RD400 is one of the most popular machines with riders in the production road racing category. You might not want to take to the racetrack, but if you want all the thrills and excitement that a racebred machine can offer, than the Yamaha RD400 is for you! One of the very first sports machines ever introduced by Yamaha was a 250cc two-stroke twin and it was acknowledged by all as one of the toughest fastest bikes in its class. Now, over 15 years later, nothing has changed. Yamaha are still making a superb 250 two-stroke, twin cylinder sports machine and it`s still acknowledged as one of the leaders in its class. Chosen by sporting riders and production racers as the ultimate 250, Yamaha's RD250 has an engine that still has all the hallmarks of its race breeding, The Yamaha 250cc twin cylinder power unit has taken many riders over the years to World Championships and Grand Prix wins and it is still doing just that! The RD250 engine shares many of the features of the racing power units and these similarities show up in its overall performance. Torque Induction, Autolube oiling, cast wheels with front and rear disc brakes, a frame based on recent Yamaha racing machines and six speed transmission. All of these things combine to make the RD250 one of the most exciting projectiles in its class. Again! The Yamaha RD200 has established itself in past years at the top of the lightweight street bike field and the 1978 version of the machine continues that tradition in an even more emphatic manner. Light in weight, easy to handle and economical to run, the RD200 cannot fail to find favour with lightweight fans ... especially those who like their lightweights fast! The 200cc twin cylinder engine has a direct relationship to Yamaha's Grand Prix winning two-strokes and this shows up in the sparking acceleration and high cruising speed. Cast wheels and disc brakes emphasise the true sporting nature of the RD200 while rider comforts are not neglected. Comforts like an electric starter and a wide, comfortable seat that would do justice to much bigger machines. Whether you use the lightweight and precision handling to weave through the rush hour traffic to work or if you prefer to play racer on the back roads, the RD200 has to be top of your lightweight list. "Good things come in small packages" says an old maxim ... and the Yamaha RD125 is motorcycling proof of that statement! Howling its way to 10,000rpm, the RD125 has a power unit that is almost identical to machines that, not so many years ago, were winning World Championships for Yamaha. Now those same engines in refined form are providing lightweight enthusiasts with one of the most exciting rides on the road. The little RD125 is a true sports thoroughbred with its racing heritage moulded into every line. Even the chassis is based on Yamaha racing design and the whole machine handles, brakes and performs in a manner that belies its engine size. It‘s one of the safest, sportiest machines on the road, regardless of capacity and one of the most comfortable too. A wide, comfortable seat that would not be out of place on a big touring machine combines with full instrumentation and adds luxury to the sporting package. Whichever way you look at it, there's no way the competition can handle what the RD125 has to offer. The little RD50 is Yamaha's smallest sportster and though it's tiny ... it’s tough too! Putting all of Yamaha's racing experience to work in a scaIed·down package, the RD50 has all the attributes of the bigger sporting machines.